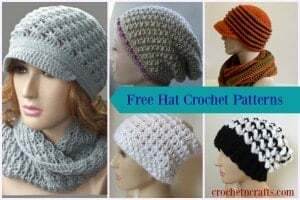 This crochet handbag pattern is worked up in the cross stitch and then finished with a nice ribbed texture at the top and along the handles. The bag is worked in one piece from bottom to top, and the ribbing rows are worked separately for a clean finish. To give this bag a professional makeover you will want to line it, not only for durability, but for it to maintain it’s texture as well. Another option is a zipper to help keep your belongings safe. Here is a tutorial that shows how to line a bag with an optional zipper. When choosing your material for lining this bag you can use either a contrasting or matching material. The above bag was lined with a contrasting material and I love how it turned out. Below the handbag is shown in black and personally, I think a black lining would have looked stunning here. But any fun colors would work! 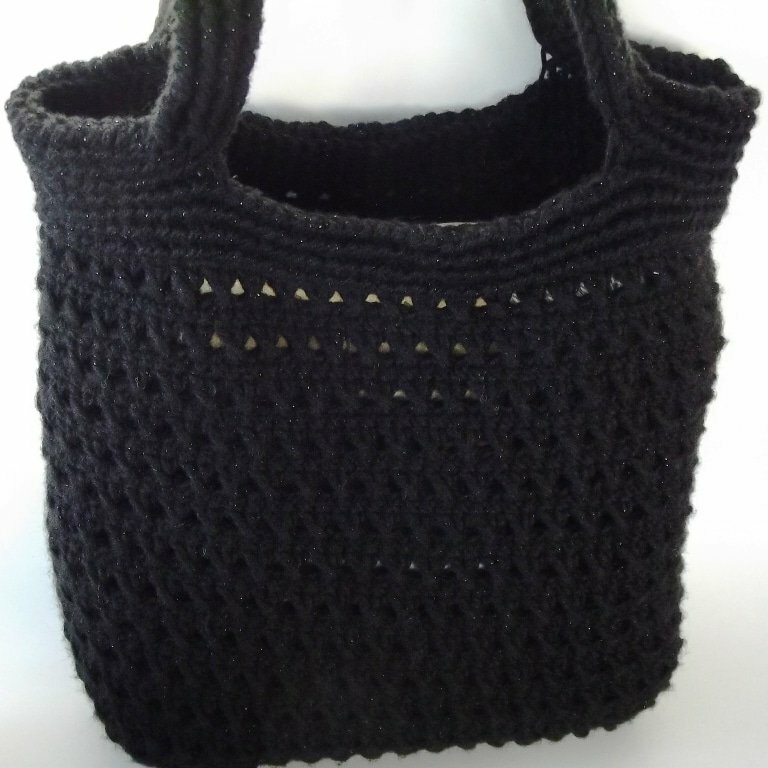 Ribbed Crochet Handbag Pattern – Shown in Black. This is an intermediate design. If you are looking for something easier then you might enjoy this crochet bag or this small crochet bag. 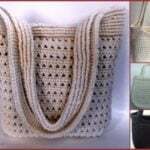 For more beautiful textures you might enjoy the Lacy Textures Crochet Bag Pattern or the Bouncy Bubbly Tote. Purchase your ad-free copy here or scroll down for the free version. Yarn: Red Heart Shimmer (Two 3.5oz/100g balls) or any medium worsted weight yarn. Crochet Hook: G/4.00mm or any hook suitable for yarn. Gauge: 2″ across 8 sc sts and over 9 sc rows. Finished Size: When laying flat, it measures 12″ wide by 12″ high along the sides. The measurement in the center from the bottom up to where the handles break off is 11″ high. The ribbing at the top is done with the reverse single crochet (rsc). The stitch is on the difficult side to keep even. The good news is that you can make this handbag pattern with or without the ribbing. The ribbed handles will need some blocking in order to get the floppiness out. To do that, dampen the handles, lay them flat and place between a damp towel. Allow to dry. Rnd 10: Ch 1, sc in first st and in each st around; join with sl st to first sc. Rnds 11-34: Rep rnds 9 and 10 twelve times. Rnds 35-41 are worked into the bl only. Rnds 35-37: Ch 1, sc in first st and in each st around; join with sl st to first sc. Rnds 39-41: Ch 1, sc into first st and into each st around; join with sl st to first sc. (210 sts) FO. Ribbing for Rnds 34-41: Join yarn along seam to front lp of rnd 34. *Ch 1, working into fl, rsc in same st and in each st around; join with sl st to first rsc. FO. Rep the above instructions for rnds 35-41 fastening off and rejoining yarn to the next rnd. For extra strength, you might want to reinforce the four areas where the handles meet the bag in Rnd 38. You can do that by taking another piece of yarn and weaving it through the loops. Another option is to line the handles as well. 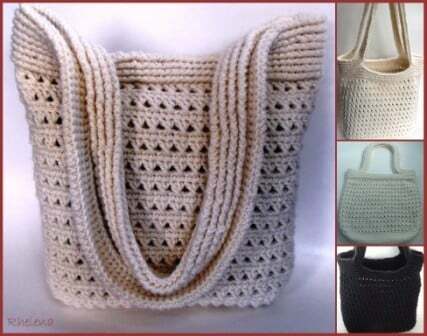 If you enjoyed this crochet handbag pattern you might also enjoy more crochet bag patterns here on CNC.